POWERGRID operates around 1,29,035 Circuit Kms. of transmission lines along with 207 Sub-stations (as on March 31, 2016) and wheels about 55% of total power generated in the country through its transmission networks. POWERGRID also operates around 36563 Kms. of telecom network. 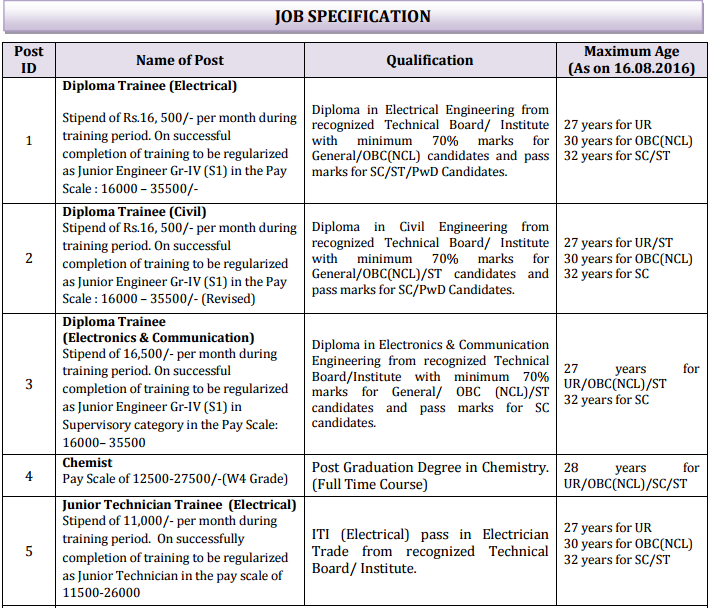 Western Region Transmission System-II covering the states of Gujarat , Madhya Pradesh, UT of Daman and Diu and UT of Dadra Nagar Haveli requires bright, committed & energetic persons to join its fold as Diploma Trainee (Electrical/Civil/Electronics & Communication) , Chemist and Jr. Technician Trainee (Electrical) for filling up current vacancies.